Meanwhile lets just say that we are proud Lovey contributed a whooping 25 entries. Magic Moments #24 Love makes it a happy meal! Magic Moments #23 Get well with Love! One of the ways I shared the Love Shaker that touched me the most deeply, was with one of my friends who was in the hospital. Magic Moments #22 Pets with Love! It’s a great daily reminder to keep Love flowing through my life. Magic Moments #21 A teachers gift of Love! I have gotten such good reports back. It really works! I find myself drawing hearts all over my chalkboard in my office. 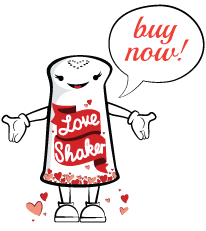 I always use my love shaker to shake love on all the food before I eat it. Grandma shaking love on baby Connor who seems mesmerized by the Love Shaker. Shaking a little extra love on a miracle!